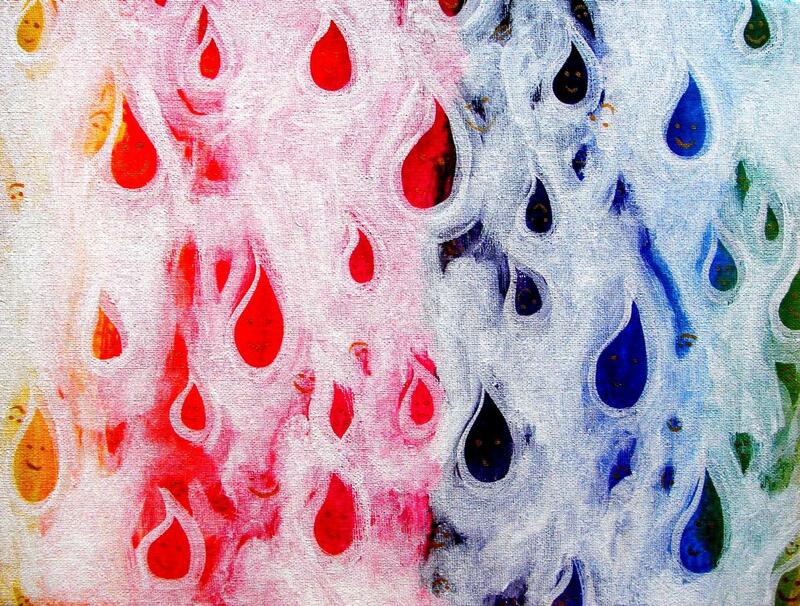 This series of paintings was inspired by The Dreamtime or Dreaming in the Australian Aboriginal sense of the word. 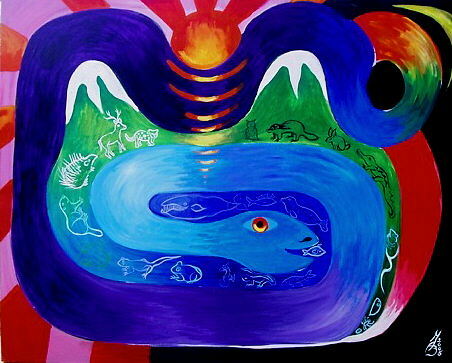 Having said that, many of my paintings start in a dream and I do a lot of shamanic dreamwork with students! 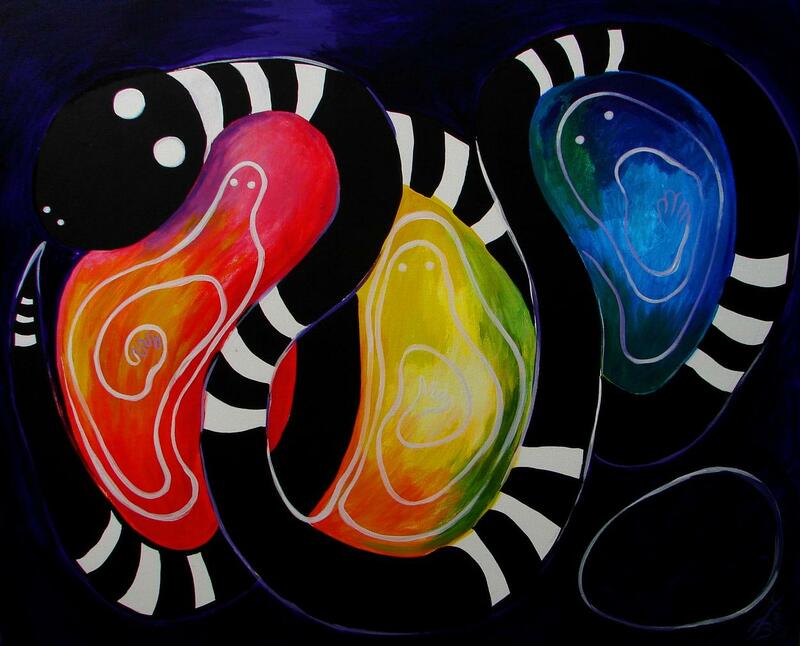 Australian Aboriginal people believe that before the world came into existence, there was a mass of dark and formless matter, (what the Ngarinyin people call ngallalla yawun, 'everything soft like jelly'). 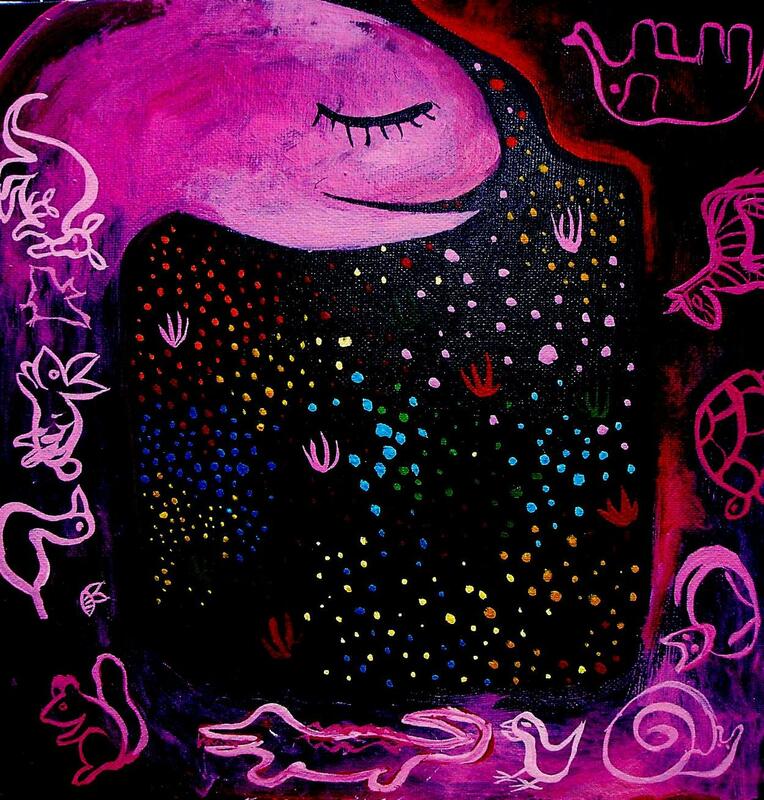 The Spirit Ancestors lay deep beneath the surface of the shapeless, nameless world and came forth as Rainbow Serpent Women, Kangaroo Men, Sisters from the Sky, Bush Fig Men, Mulga Seed Women, and so forth. 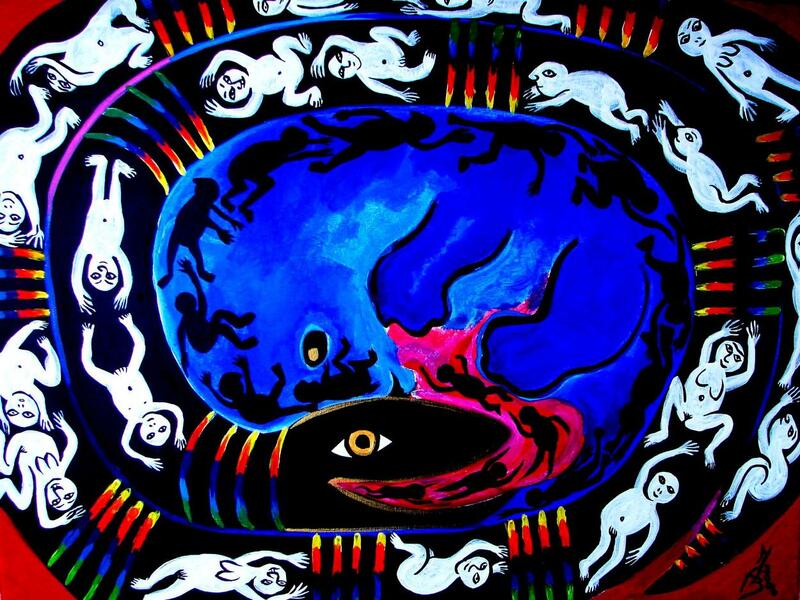 These Spirit Ancestors became the prototypes of all creatures alive today and established a line of descendants for the human, plant and animal worlds. To emphasize the cyclical nature of this process this painting does not have a proper top or bottom. It can be rotated and viewed in four different positions! All cultures have myths or religious beliefs about Creation a cosmology). In Australia it was believed that Ancestor Spirits formed, named and breathed life and language into all that exists in the known Universe. This is the touchstone of all Aboriginal culture and religious practice. This divine inheritance is known as The Law. It is continuously being re-enacted in ritual and ceremony. 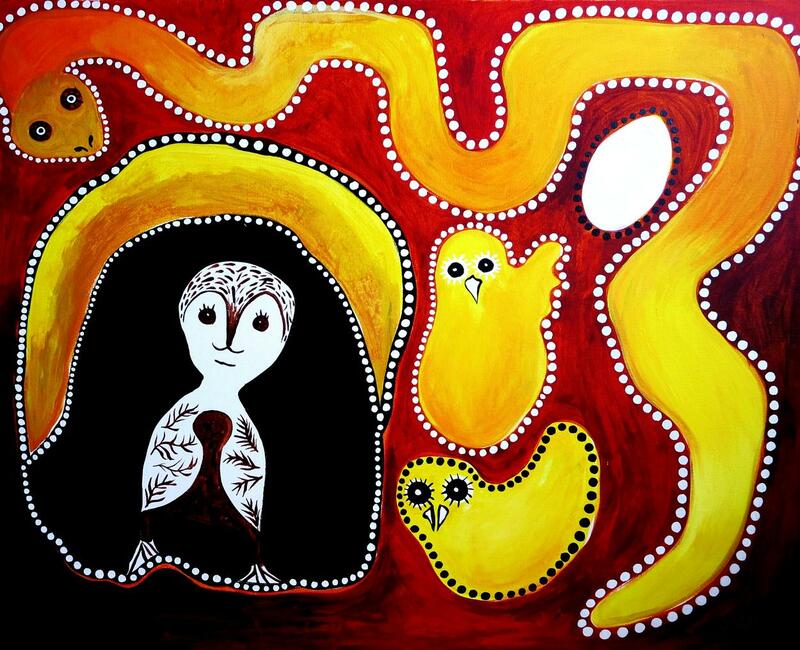 Aboriginal people recognise that they have a spark of their Spirit Ancestors within them and that give them an unbroken link to the Creation Epoch, The Dreamtime or The Dreaming. Every dawn is the Dawn of the Universe. It is a shocking fact that it was only at the referendum of 27 May 1967 (my year of birth!) that Aboriginal residents of Australia were granted full legal status as Australian citizens. This is mind boggling when one considers that Aboriginal Australian peoples occupied the land for tens of thousands of years before white Europeans arrived on the scene. Traditional Aboriginal people were multilingual. Originally there were around 300 (possibly even 500) Aboriginal languages. Today these languages face the threat of extinction. Many languages are weakening and no longer spoken to or understood by the younger generation. Following colonization successive white governments regarded the Aboriginal societies as uncivilised and brutal practises were committed. From widespread (I typed 'whitespread' - a Freudian slip!) massacres in some regions, to government policies of 'protection', where children were forcibly removed from their parents and relocated in orphanages, missions and foster homes. These children were then indoctrinated in the values of the dominant culture. A handful of these children - now known as 'The Stolen Generations' - have tracked down their parents, but thousands never returned to their homes. This has led to an incalculable loss; whole generations torn from their famiies and alienated from their own cultures. 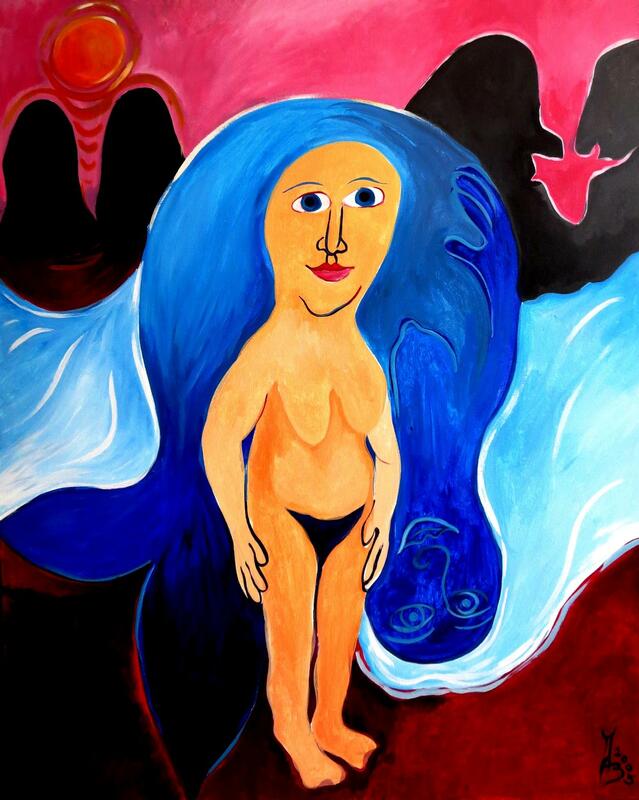 This painting was inspired by being pregnant for the third time and attending playgrounds with my two toddlers. Many mums were pregnant and the unborn babies seemed to be communicating and become friends well before birth! 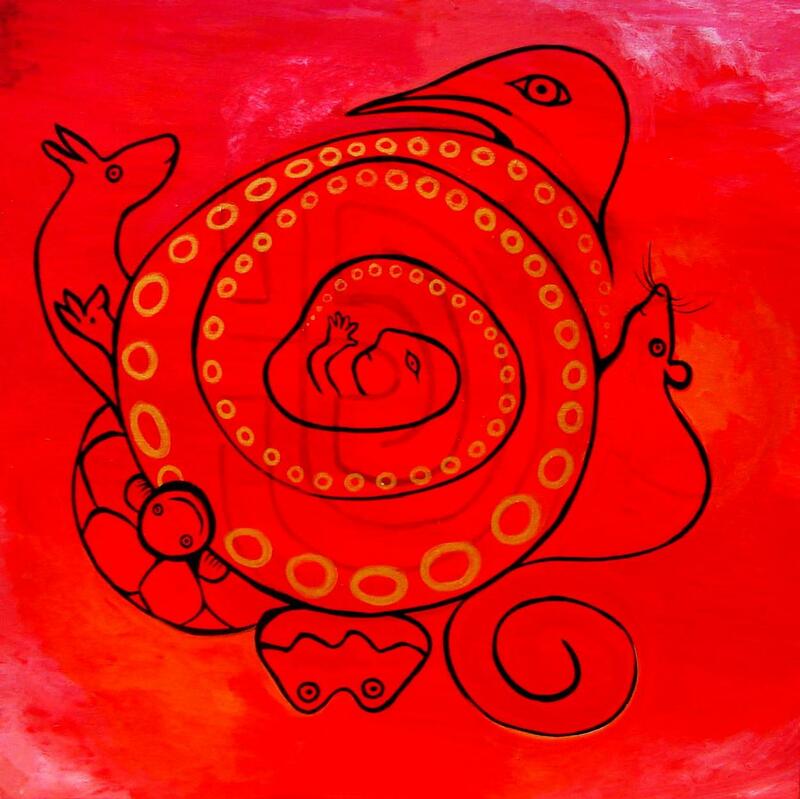 In shamanism we acknowledge non-human ancestors such as animals, trees the elements, or features in the landscape. This painting is about a woman whose mother is a river. 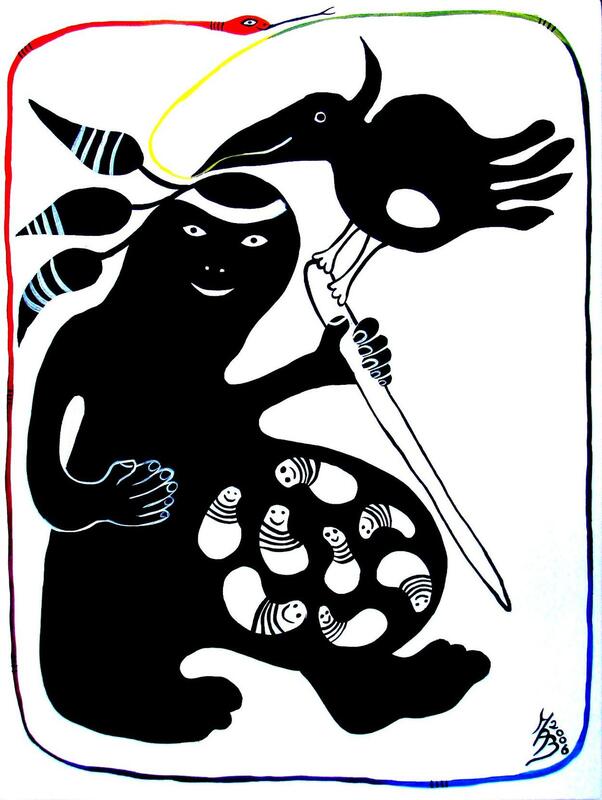 One interesting detail is that it was believed that the Rainbow Serpent could take on different guises. And that Imberombera was one of her guises. 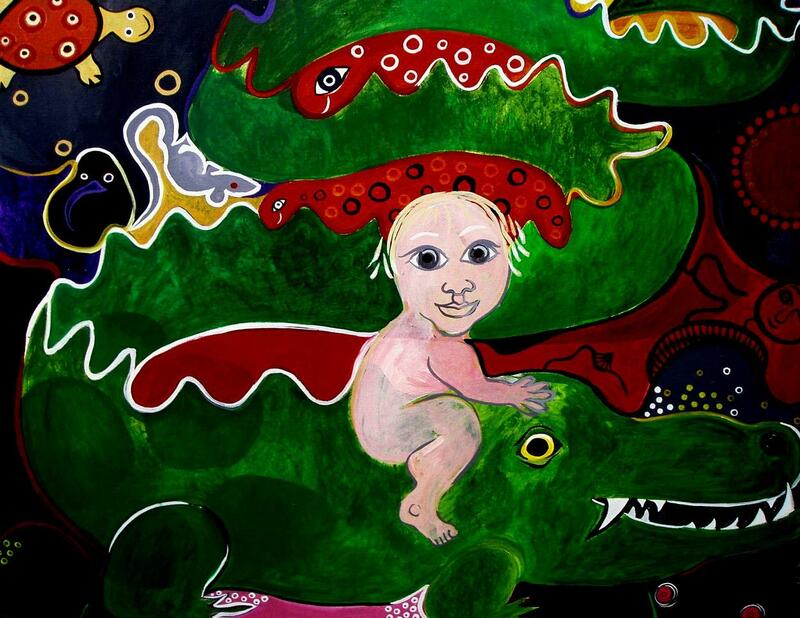 For that reason my painting is 'framed' by the Rainbow Serpent appearing along the edges of the canvass Another detail is that in the painting I have given Imberombera six fingers on both hands. It was believed that this was a sign of someone being 'not quite human', but an incarnation of the 'Divine'. It is interesting to note that this same idea appears in Mesoamerica. Gods are depicted with six fingers! 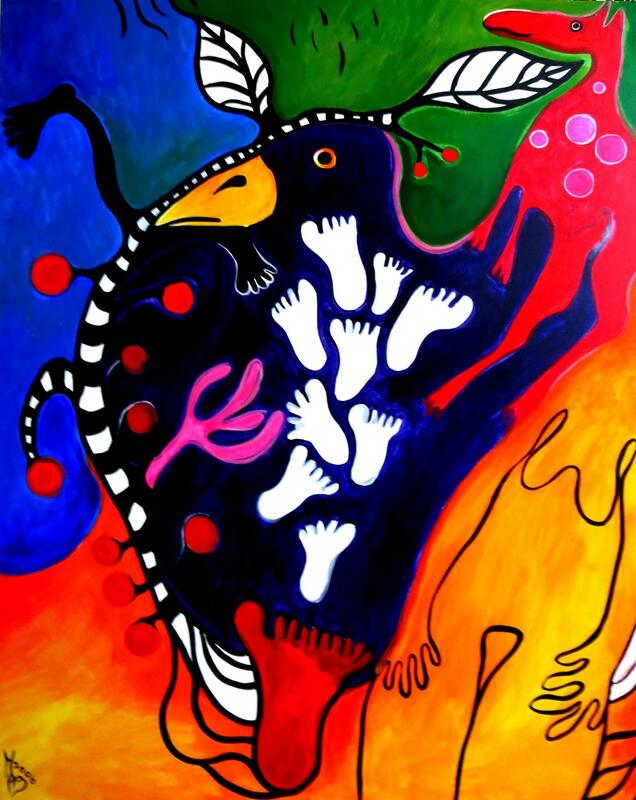 This painting was inspired by rock art made by the Ngarinyin people. The so called 'Guloi' tree is a native plum tree. The single footprint at the very bottom has ten toes. It symbolises the track of an individual ready to journey along the pathway of knowledge. The foot is attached to the tree by several roots that symbolise family blood and family connections. Education comes from 'climbing the tree' and is represented by rings on the trunk. Rain descends from the sky onto the tree. This symbolises the arrival of monsoon rains, when lightning triggers the ripe fruit to swell and burst, then crack open and release new seed. For the Ngarinyin people this is the Tree of Life that feeds everyone. It symbolises the responsibility they have to new life, their duty to set young people on the right pathway to tradition and wisdom. MiMi figures are small stick-like spirits. They are said to live in bush and rock crevices in Arnhem Land in the very North of Australia. They are regarded as great artists because they like painting their portraits in red ochre on rocks! 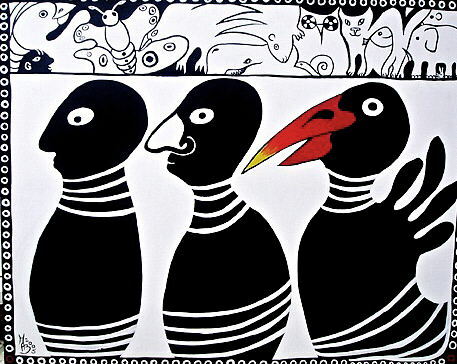 Mimi spirits are not Creator Beings, but they taught the ancestors of the present-day Gunwinggu tribe the art of painting. 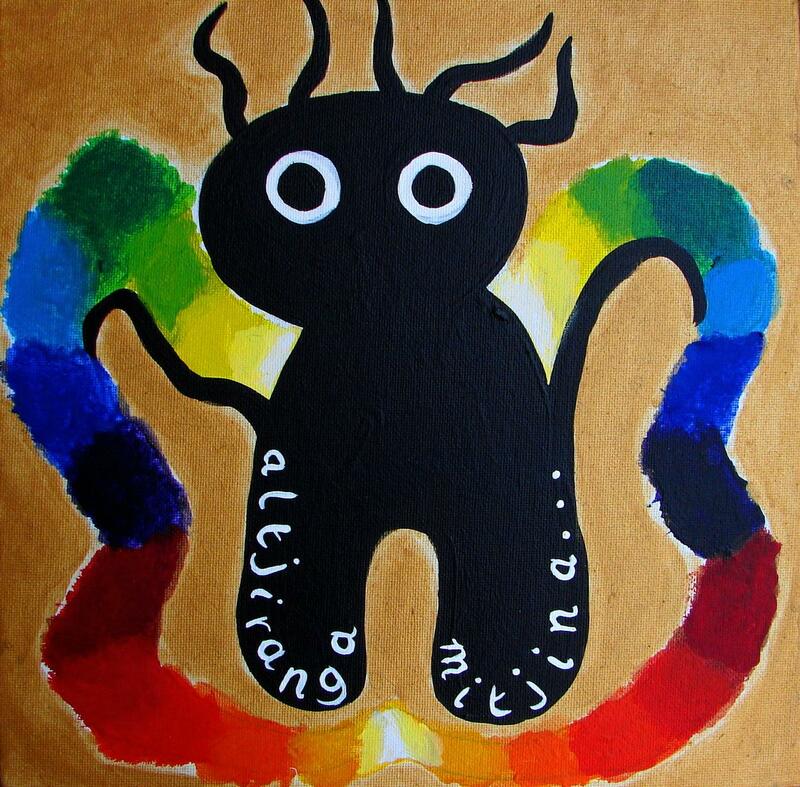 Mimi spirits can be enchanting creatures, but one must realise they can be malevolent as well as benevolent. 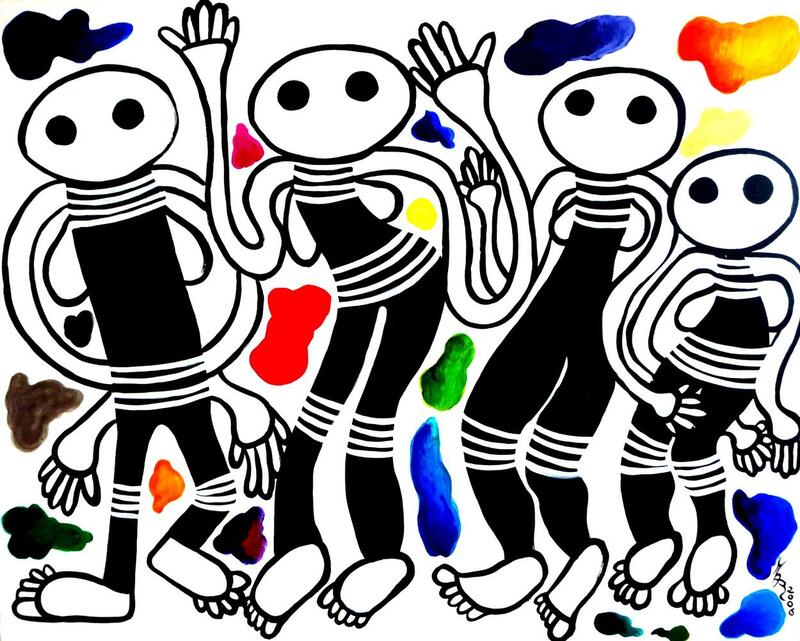 As a painter I wished to create a tribute to the Mimi spirits for giving human beings the art of painting! Jurtus are tiny spirit children who descent to earth in raindrops, looking for a human mother. Similarly there are Wilmi: spirals of mist are seen as evidence of children to be born gliding along. People living on the coast believed that the spirits of unborn babies reside in shallow waters and coral reefs at low tide. 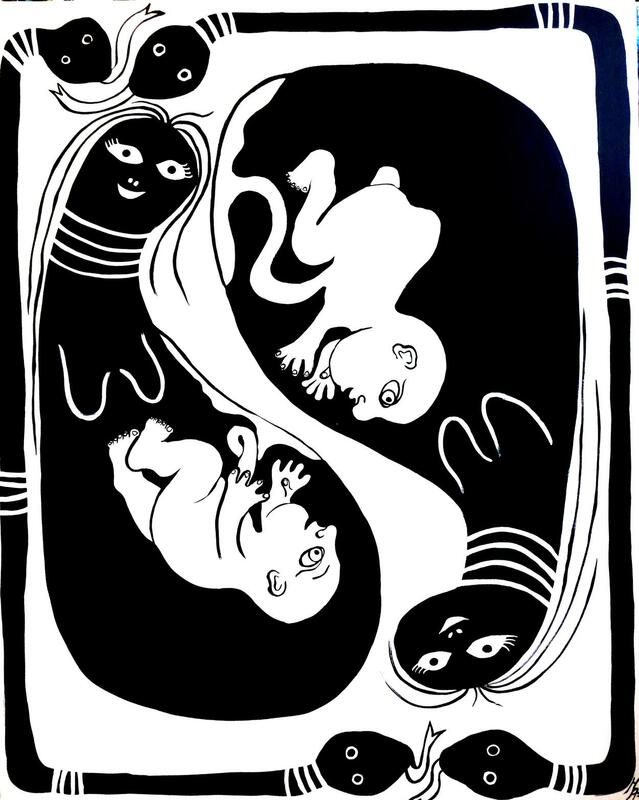 There was a very general belief that spirits of children to be born resided in waterholes (see "Billabong"). 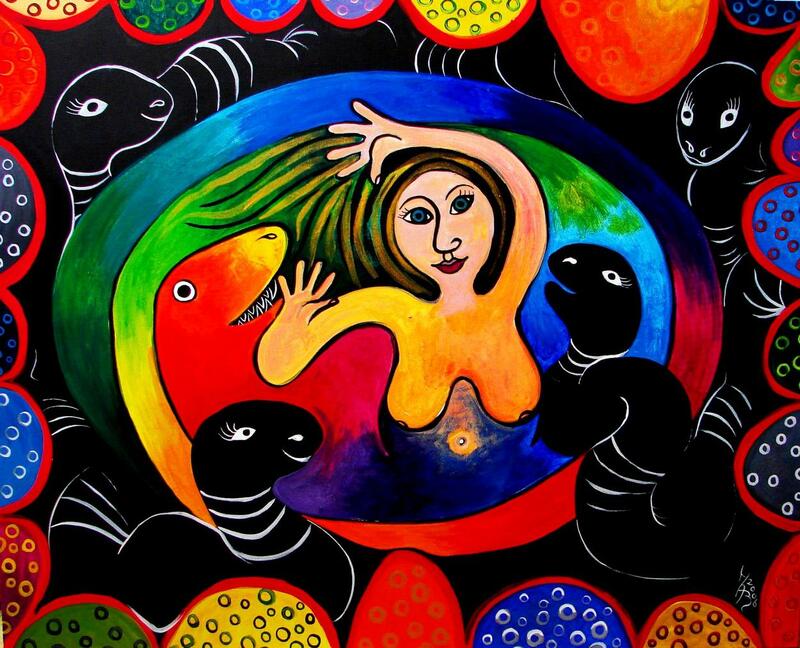 The 'Daughters of the Rainbow Serpent' are similar to the sirens of European mythology.They inhabit rivers and creeks. They are lovely but lethal! However feminine and enchanting they may look, they are alien and dangerous creatures. Woe betides a man who falls in love with one! Like Homer's sirens they lure men to their death with songs that weave a spell.